Chronic Sclerosing Glomerulopathy refers to an inflammation of the tiny filters in the kidneys (glomeruli). The function of glomeruli is to remove excess fluid, electrolytes and waste products from the blood stream and pass them into the urine. It can occur suddenly (acute) or gradually (chronic). This can occur on its own or as a part of another disease such as lupus or diabetes. In this disease, kidneys gradually lose their filtering ability. Less than 10% normal capacity of kidney function results in end stage kidney disease which is termed as a chronic glomerulopathy disease. The acute form of glomerulopathy may more likely to develop chronic sclerosing glomerulopathy later on. WHAT ARE THE SYMPTOMS OF CHRONIC SCLEROSING GLOMERULOPATHY? Signs and symptoms of chronic sclerosing glomerulopathy depends upon the acute or chronic form of the cause. Foamy urine due to excess protein (proteinuria). Pink or brown coloured urine due to the presence of red blood cells in the urine (hematouria). Fluid retention (edema) with swelling evident on the face, abdomen, hands and feet. The chronic form of glomerulopathy may creep up without showing any symptoms. There may be slow development of symptoms similar to the acute form. Swelling in the ankles as well as on the face. Bubbly or foamy urine from excess protein. Glomerulopathy may become so advanced that it may lead to kidney failure. WHAT ARE THE CAUSES OF CHRONIC SCLEROSING GLOMERULOPATHY? Exposure to some hydrocarbon solvents. High blood pressure: This can damage the kidneys and impair their ability to function normally. Chronic sclerosing glomerulopathy can also lead to high blood pressure as it reduces the kidney function and also influence how the kidneys handle sodium. Diabetic kidney disease (Diabetic neuropathy): Anyone who is diabetic is at the risk of developing chronic sclerosing glomerulopathy, usually taking years to develop. Good control of blood sugar levels and blood pressure might prevent or can slow the kidney damage. Urine test: A urinalysis might show red blood cells and red cell casts in the urine which indicates a possibility of damage to the glomeruli. Blood tests to provide information about kidney damage and impairment of the glomeruli by measuring levels of waste products such as creatinine and blood urea nitrogen. Kidney biopsy: This test involves a special needle to extract small pieces of kidney tissue for microscopic examination. It is always necessary to confirm the diagnosis. Modern treatment includes dialysis to remove the excess fluid and to control high blood pressure. The only long- term therapies for end-stage kidney disease in modern medicine is kidney dialysis and kidney transplant. Planet Ayurveda offers Revive Kidneys Pack (RKP) for the treatment of Chronic Sclerosing Glomerulopathy which includes effective herbs and herbal supplements for the management of kidney diseases. This pack is an excellent herbal treatment for all the kidney disorders. This product of Planet Ayurveda is prepared from the effective and wonderful herbs which provides relief from all the kidney disorders. This churna is even recommended in all the chronic kidney disorders. This churna acts as diuretic and provides natural anti-oxidants and nutrition to the body. The Mutrakrichantak Churna is prepared by using the herbs as described in ancient ayurvedic texts. It is very effective in regenerating kidney cells or nephrons that do not function. It is one of the best herbal remedies for kidney care. Dosage: 1 Teaspoonful twice daily with water and for best result Boil 1 Teaspoonful in 400ml water until it remains 50-60ml. Filter the preparation with a regular tea strainer and drink. You should use this once in morning 45min. after breakfast and similarly in evening 45min. after dinner. Prepare fresh every time as per this. The Rencure Formula is a combination of herbs that are described in ancient texts to cure chronic kidney disorders. It is an effective herbal remedy for chronic sclerosing glomerulopathy. These capsules rejuvenates the dying cells and helps to revive the dying organs of the body as well as act as natural cleanser by helping the kidneys to eliminate the toxins without causing any side effects. 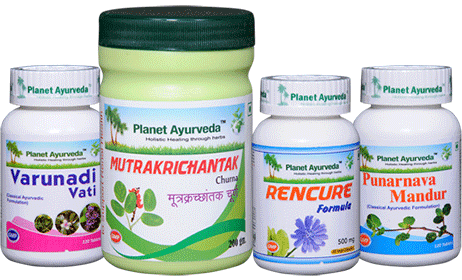 Varunadi Vati of Planet Ayurveda are prepared from a combination of herbs which have anti-inflammatory and diuretic properties and which are useful in the management of various kidney diseases. Dosage: 2 tablets thrice daily. The herbs present in punarnava mandoor tablets are very effective in removing the toxins from the body. These tablets also act as a natural diuretic and has anti-inflammatory properties.